Japan, early 20th century. Lieutenant B.F. Pinkerton of the U.S. Navy leases a house overlooking Nagasaki harbour that comes with three servants and a geisha wife named Cio-Cio-San, known as Madame Butterfly. Unsure if his feelings for the young girl are love or a whim, Pinkerton decides to marry her anyway, intending someday that he will take a real, American wife. Anthony Minghella’s breathtaking production has thrilled audiences ever since its premiere in 2006. 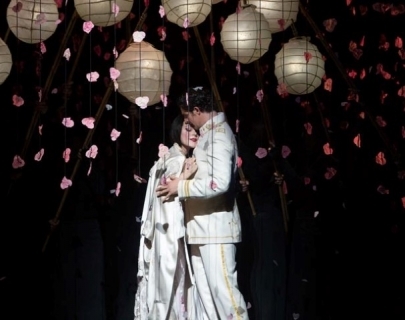 One of the world’s foremost Butterflys, soprano Kristine Opolais, takes on the title role, and Roberto Alagna sings Pinkerton, the naval officer who breaks Butterfly’s heart. Karel Mark Chichon conducts.